Shanghai widened its ban on public smoking Wednesday as China’s biggest city steps up efforts to stub out the massive health threat despite conflicts of interest with the state-owned tobacco industry. Nearly a quarter of adults in the commercial hub of 24 million people are smokers, according to the state-run People’s Daily newspaper, citing data from the Chinese Association of Tobacco Control. Shanghai has had a limited ban on public smoking since 2010, but the regulation covered only certain spaces such as schools and libraries. The new rule expands the restrictions to all public indoor areas and some outdoor ones. In June 2015 Beijing municipality adopted the toughest anti-smoking legislation in the country, banning smoking in offices, restaurants, hotels and hospitals. The southern city of Shenzhen introduced similar rules in 2014. China has long said it plans to ban smoking nationwide. In November, government health spokesman Mao Qunan indicated measures would be rolled out across the country by the end of last year. But the measures, which have been available for public comment since 2014, still have not been put into effect. Anti-smoking measures pose a dilemma for China. On one hand, smoking has created an enormous burden on the public health system — leading to as many as one million deaths in 2010, according to a 2015 study in medical journal The Lancet. On the other, the state-run tobacco industry provides the government with an enormous source of income: 1.1 trillion yuan ($160 billion) in taxes and profits in 2015, according to the most recent figures, up 20 percent year-on-year. China’s tobacco regulator shares offices and senior officials with the state-owned China National Tobacco Corp — a near-monopoly and by far the world’s biggest cigarette producer. The China representative of the World Heath Organization, Bernhard Schwartlander, said Tuesday in a statement that “the tobacco economy has all but stopped progress on a national smoke-free law”. “Largely because the tobacco industry in China, which has a vested interest in maintaining an economy based on the production and use of tobacco, dominates the official government body meant to curb tobacco use,” he said. The new Attorney General, Jeff Sessions, is concerned about marijuana. Yesterday he said that he doesn’t want it to be “sold at every corner grocery store.” You can’t get weed at many corner stores just yet, but there is a product at those stores that kills about 400,000 Americans each year. And Sessions has vigorously defended the interests of that product. I’m talking, of course, about tobacco. With more states legalizing marijuana for both medicinal and recreational use, the newly confirmed Attorney General says that he’s concerned about the drug. Sessions says it’s about health. But back in the 1990s and 2000s, he wasn’t so concerned about the real health epidemic of cigarettes. Oh gosh golly! Marijuana being sold at every corner grocery store! But what about all those corner stores that have a much deadlier product called cigarettes? Funny you should ask. Because the tobacco industry helped get Jeff Sessions elected to the Senate in 1996. In fact, Session got a bit too much money from R. J. Reyonlds, the makers of Camel cigarettes, during his 1996 campaign. 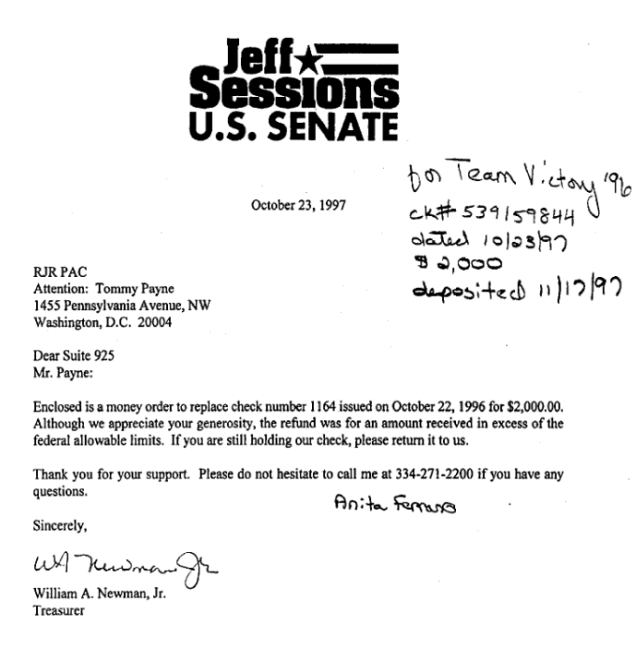 In October of 1997 his staff had to send money back to the company because they had donated more than was legally allowed. Sessions would go on to rail against the lawsuits that the tobacco industry was facing in the late 1990s. During a private dinner, Sessions called the lawsuits “extortion” and said that it would lead to “shake downs” of other industries. “If we let them get by with this extortion of the tobacco industry, then they’ll start shaking down other industries, one after the other,” Sessions said at a private dinner in July of 1997 with Bill Orzechowski, Chief Economist for the Tobacco Institute, a tobacco industry front group that tried to advocate against tobacco control policies. How do we know Sessions said this? Thankfully, we have an archive of documents at the University of California-San Francisco that came out of a settlement with the Big Tobacco companies in the late 1990s, known as the Master Settlement Agreement (MSA). The Sessions quote about shakedowns comes from an email from tobacco industry insiders that was reporting back to R. J. Reynolds about how legislators would deal with the threats to their industry. Back in the 1990s, states were pissed that they were paying for healthcare costs from smoking related diseases, and they started suing the tobacco companies one by one. Mississippi was the first to sue in 1994, and by 1997 had won, something nobody had ever done successfully against the tobacco industry before. Other states started to sue, and pretty soon enough states were emboldened that they lumped it all up into one big settlement. The Master Settlement Agreement included handing over decades of documents showing that the tobacco industry knew tobacco was addictive (contradicting sworn testimony by every major tobacco exec in 1994), that tobacco was harmful to health (another thing that the industry denied for decades), and that the tobacco industry was explicitly targeting kids with their advertising. Sessions also introduced a pro-tobacco industry amendment in 1997 that would cap how much money lawyers could make from suing tobacco companies. The goal was evidently to hamper legal efforts to go after the tobacco industry, which was spending millions to fight regulation of its product. The Sessions amendment was narrowly defeated. A chastened Senate voted emphatically Wednesday to undo a $50 billion tobacco-industry break that had been slipped into a tax-cut bill signed into law just last month. Voting 95-3 to repeal the provision, senators rather contritely agreed to an amendment that unraveled what sponsor Richard Durbin, D-Ill., called a “sweetheart deal” for the industry. But the repeal was nearly derailed by an amendment from Sen. Jeff Sessions, R-Ala., who tried—and nearly succeeded—in limiting the fees that can be collected by attorneys hired by the states to press damage claims against the tobacco industry. Durbin and his allies defeated the Sessions amendment on a 50-48 vote by arguing that it would put states at a big financial disadvantage in their long and expensive legal jousting with the tobacco industry. As late as 2004, Sessions was still opposed to FDA regulation of tobacco. And no, that’s not a typo. The tobacco industry fought regulation of its product for decades and FDA was only granted regulatory authority over it in 2009. Again, that’s not a typo. When the Senate passed a compromise bill on regulation of tobacco by the FDA in 2004, Sessions was disgusted. He fought against regulation of tobacco as a drug using everything from free speech arguments to boilerplate pro-business language. “One bad bill that couldn’t pass on its own attached to another bad bill that can’t be passed on its own,” Sessions said at the time, referring to the part of the proposed 2004 bill that also provided $12 billion to tobacco farmers who pledged to stop growing the product. By 2009 he had finally come around and voted to allow the FDA to regulate tobacco as a drug—something that Philip Morris, an enormous tobacco company, was also supporting by 2009—because it was clear that the ridiculous fight against it had been lost. The tobacco document archive (which is searchable online here) really is fascinating, and a search for “Jeff Sessions” or “Senator Sessions” gives hundreds of responsive documents about how the legislative and lobbying sausage gets made. If we’ve learn anything about Sessions from the documents, it’s that he’s much less concerned about health than he is about maintaining the disastrous “war on drugs” of the bad old days. That is, as long as those drugs don’t include tobacco, the one that kills hundreds of thousands of Americans each year. On Wednesday, Shanghai becomes the latest municipality in China, following Beijing and Shenzhen, to launch a 100 percent smoke-free policy in public places and work spaces. Some 60 million people－more than the population of many countries－living in these cities can now enjoy smoke-free public places. While we congratulate Shanghai on joining Beijing and Shenzhen as global leaders in tobacco control, we must also ask: How is it that only three cities in China have adopted comprehensive smoke-free policies? What is standing in the way of the rest of the 1.3 billion citizens having the right to smoke-free indoor air in their workplaces and factories, and in restaurants and shopping areas? President Xi Jinping has announced his vision for China’s future. First, he announced the Chinese Dream; then he called for the Chinese economy to reinvent itself, led by industrial innovation; and last summer, he announced his Health China 2030 initiative, a bold declaration that made public health a precondition for all future economic and social development. As evidenced in this remarkable series of policy announcements, Xi’s vision for China is one in which economic growth enhances, rather than sacrifices, individual well-being. Unfortunately, there remains a glaring obstacle to realizing the Chinese Dream and Healthy China 2030 vision－an obstacle which has resisted the considerable efforts of China’s public health authorities, advocates and citizens: the tobacco economy. Tobacco represents an economy of the past. China’s tobacco companies do not fit the vision of an economy driven by innovative, value-added manufacturing and a strong service sector. Its very reliance on Chinese smokers undermines efforts to build a healthy China by 2030. We celebrate the smoke-free laws in Beijing, Shanghai and Shenzhen. But they are among the wealthiest cities in China, which raises the question of inequality. Smoke-free indoor air should not be a luxury for the wealthy, rather an entitlement for all Chinese citizens who are working hard to realize the Chinese Dream. Why is this not happening? The reason is largely because of the short-sighted economic interests that are not aligned with the President’s vision. The small but successful tobacco tax adopted in 2015, which reduced smoking and increased government revenues, should be drastically increased so that the tobacco companies pay more tax and farmers start growing alternative crops. Instead, there is continued resistance to further tobacco taxes and stronger advertising restrictions. Most concerning is that progress has all but stopped on a national smoke-free law. To those who doubt whether rural governments are capable of implementing a comprehensive smoke-free law, I would point to the hundreds of millions of people China pulled out of poverty in three decades－a much tougher implementation challenge, achieved through strong government leadership and coordinated action at all levels. Xi’s vision for China’s future is clear. The country’s leadership should pass comprehensive legislation against tobacco to ensure all Chinese citizens, not just those in the wealthiest cities, can breathe smoke-free air indoors. Electronic cigarettes (e-cigarettes) have gained unprecedented popularity, but virtually nothing is known about their cardiovascular risks. To test the hypothesis that an imbalance of cardiac autonomic tone and increased systemic oxidative stress and inflammation are detectable in otherwise healthy humans who habitually use e-cigarettes. Cross-sectional case-control study of habitual e-cigarette users and nonuser control individuals from 2015 to 2016 at the University of California, Los Angeles. Otherwise healthy habitual e-cigarette users between the ages of 21 and 45 years meeting study criteria, including no current tobacco cigarette smoking and no known health problems or prescription medications, were eligible for enrollment. Healthy volunteers meeting these inclusion criteria who were not e-cigarette users were eligible to be enrolled as control individuals. A total of 42 participants meeting these criteria were enrolled in the study including 23 self-identified habitual e-cigarette users and 19 self-identified non-tobacco cigarette, non-e-cigarette user control participants. Heart rate variability components were analyzed for the high-frequency component (0.15-0.4 Hz), an indicator of vagal activity, the low-frequency component (0.04-0.15 Hz), a mixture of both vagal and sympathetic activity, and the ratio of the low frequency to high frequency, reflecting the cardiac sympathovagal balance. Three parameters of oxidative stress were measured in plasma: (1) low-density lipoprotein oxidizability, (2) high-density lipoprotein antioxidant/anti-inflammatory capacity, and (3) paraoxonase-1 activity. Of the 42 participants, 35% were women, 35% were white, and the mean age was 27.6 years. The high-frequency component was significantly decreased in the e-cigarette users compared with nonuser control participants (mean [SEM], 46.5 [3.7] nu vs 57.8 [3.6] nu; P = .04). The low-frequency component (mean [SEM], 52.7 [4.0] nu vs 39.9 [3.8] nu; P = .03) and the low frequency to high frequency ratio (mean [SEM], 1.37 [0.19] vs 0.85 [0.18]; P = .05) were significantly increased in the e-cigarette users compared with nonuser control participants, consistent with sympathetic predominance. Low-density lipoprotein oxidizability, indicative of the susceptibility of apolipoprotein B-containing lipoproteins to oxidation, was significantly increased in e-cigarette users compared with nonuser control individuals (mean [SEM], 3801.0 [415.7] U vs 2413.3 [325.0] U; P = .01) consistent with increased oxidative stress, but differences in high-density antioxidant/anti-inflammatory capacity and paraoxonase-1 activity were not significant. In this study, habitual e-cigarette use was associated with a shift in cardiac autonomic balance toward sympathetic predominance and increased oxidative stress, both associated with increased cardiovascular risk.